Abe starts school | Are you there..? We were spoilt for choice when it came to choosing an English speaking school for our Abe. One school looked like it was designed by Enid Blyton, complete with Magic Faraway Tree, another was completely summer fete with ice-pops, Thai dancing and games of tick, there were kids from far and wide – amazing diversity. In Manchester, Abe served a 2 term stretch in a fabulous inner city school, where assembly was interpreted in sign language, and the teachers downloaded photos onto iPads to share with the parents. It was pretty special and we were fortunate to get a place there. In his new school there are lobsters and tropical fish in tanks around the grounds, tall trees with different coloured ribbons (each colour has a different meaning in Buddhism) in the play areas, swimming pools for different age groups, a canteen that serves a worldwide menu of deliciousness, and a row of colourful scooters outside his classroom, so the children may race around the class during breaks, taking in the terrapin, water play and slides/climbing frames. He’s eating rice, something he wouldn’t do for me at home. He has a new pal, Jessica, and he’s told me tales of play-dough togetherness. 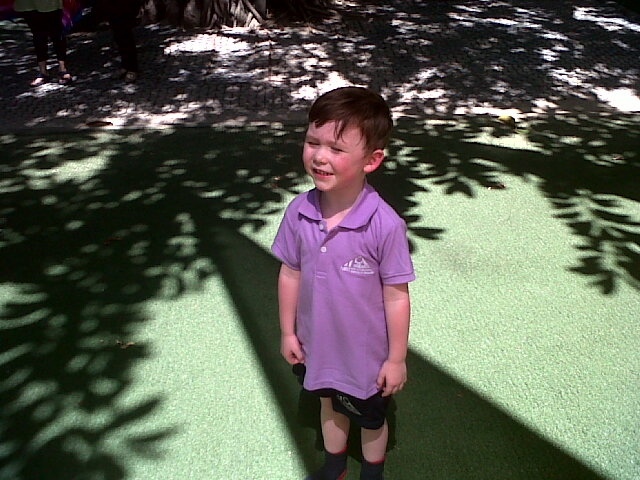 He has chosen a purple (please don’t call it lilac) t-shirt and he’s in the red house, same as me when I was at school. 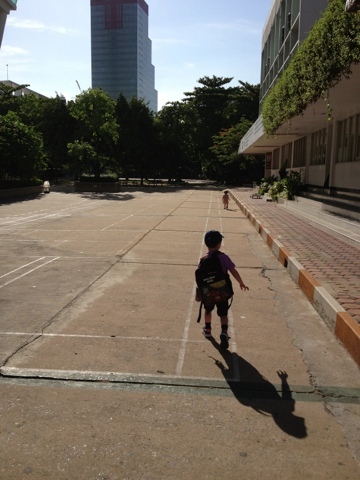 He’s been in Thailand for 7 weeks, he’s ready for school, he needs to socialise and he craves this routine. He is the only British born child in his class. The school run is trial and error, we are experimenting with different modes of transport, namely the tuk tuk, sky train and taxi, (I’m too chicken to ride the motorbikes yet, not with Abe). We’ve been late twice in 5 days, neither of us like being late. Abe wants to know if Ty will be there, “no darling, Ty lives in England”. Today when he entered the classroom his teacher played and sang “Good morning, Abe” on the xylophone. I’m not perky enough to be a school teacher, hats off. On Abe’s first big day we’re both a bit nervous. I’m trying to hide my anxieties with over enthusiasm. “Wow, what an adventure”. Mummy being chirpy in the morning, something is amiss. The cab takes us half an hour to travel 10 minutes as the crow flies. We all take him to school, James can oversee the misadventures of Patti, while I focus on Abe. In the classroom the teacher announces the new friend, and asks the kids what they’re going to show Abe today. Abe’s not really listening, he’s clinging to my leg, his face red from the heat and from stifling a sob. “The slide”, “the scooters”, “the terrapin”. The teacher draws on the board how the day will plan out – a little voice, “Is that the best you can do?” The laughter brings relief. Abe doesn’t want me to go. Drop and run possibly a better option than stay and play, but he won’t sit on the carpet with the other kids, he won’t let go of me. It’s playtime and my cue to leave, Abe cries, the little sea of beautiful faces are wondering why the new boy is crying and if I speak I too will cry so I just smile at them, our universal language. Patti is the first to grab a scooter and try to race with the other kids, she’s in the Wendy house and down a slide before we reach her. I don’t think she’ll have too much trouble when it’s her turn to join up. I sit on a swing next to Abe, watch the other kids playing, and then a lovely kid takes him for a ride on his taxi trike. I have to leave and Abe unravels, the teachers are kind and reassure him, I kiss him, tell him I love him, and promise to return at home time. I wait until I’m out of sight before I cry. James tries to comfort me with a pat on the arm but I feel far too guilty for doing this to my boy so it only makes me worse. Parenting is a series of letting go, setting them loose into the world, arming them with as many tricks for survival as possible, hoping they’ll be ok and keep coming back for cuddles. We swing by the Scottish Restaurant on the way home. It’s the nearest place open and I need a coffee. I spot a small figure lying on the plastic seats, hair dusty, feet filthy, he/she looks out of place in the spotless cafe. We order drinks and round the corner to sit down. Two more boys, aged maybe 8 or 9 lie fast asleep on the arched couch, top to tail. James and I exchange a wide-eyed look of concern. No parents are near, they’re not in school, they don’t have shoes, they’re filthy from the street. I well up again as the thought of these homeless children(?) taking refuge in the restaurant sinks in, and I realise Abe will be fine. When I arrive home I google charities in Bangkok and make some notes. I need to do something about this. To be a part of this new society, I need to contribute to it, I don’t know how yet, but something needs to be done outside of our privileged bubble. Previous: How hard do you want it? Next:Is it just me, or is everyone paranoid?